Choose a Resort, Spa, or Golf Getaway Package Below! Lake Lawn Resort offers special packages that wrap up the best that we have to offer: the rustic upscale charm of a room at the Resort, the chance to savor all the different dining experiences you could imagine, access to the leisure and sporting opportunities, and preferred option for golf. Relax. Indulge. Enjoy… and congratulate yourself for scoring a terrific rate on your getaway. Plan your lakeside escape now! Need help picking the perfect date? Visit our Special Events Calendar to find a special occasion around which to plan your vacation. Throughout the year, you will find holiday cookouts for Memorial Day, Independence Day, Labor day. We also offer Wine Dinners, Murder Mystery Dinner Theater, Dueling Pianos, Old Time Radio Shows, and other live entertainment. Our culinary staff prepares sumptuous Sunday Champagne Brunch, Saturday Prime Rib Buffet, Friday Fish Fry, Lake & Sea Fest, Lobster Boils, Mother’s Day, Easter, Thanksgiving, and Christmas Buffets, and other frequent dining events. We host Delavan-Delavan Lake Chamber community events, such as Sky Circus on Ice in February and The Cars Time Forgot Car Show in July. 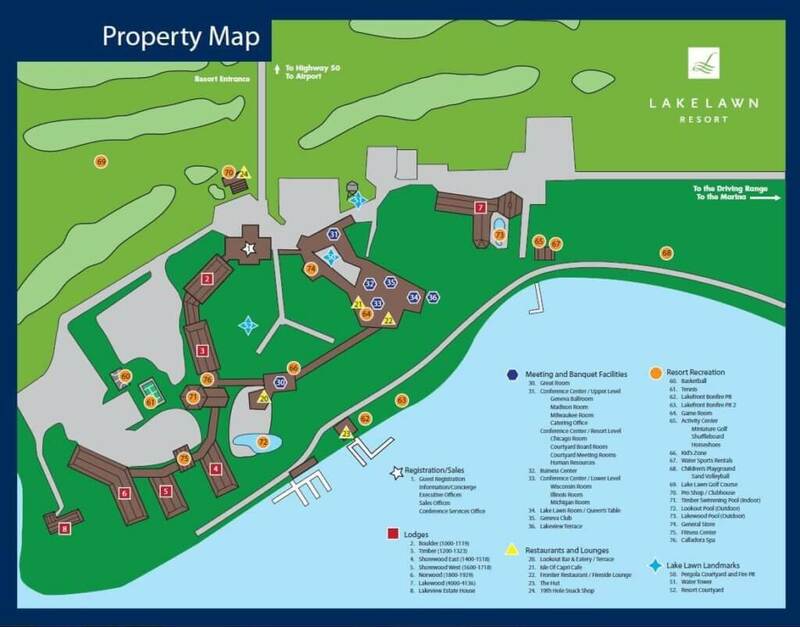 With a large variety of accommodations including a spacious suites, fun loft suites for families or groups of friends, and even a private lake house—whatever your stay size and needs, Lake Lawn Resort will be your answer! Every room and suite comes with one or more patio or balcony. Lake Lawn Resort is the Geneva Lakes area full service resort. We have our 9,000 square foot Calladora Spa, Majestic Oaks Championship Golf Course, multiple dining options, and much more. We are not just a warm weather destination. In winter, we offer cross-country skiing, snowshoeing, ice skating, nightly bonfires, and more await you at Lake Lawn Resort’s 2+miles of shoreline on scenic Delavan Lake. Spend the day enjoying the best of the lake living, then come inside for sumptuous meals created by Chef David Ross, full-service pampering at the award-winning Calladora spa, and a host of indoor and outdoor packages and activities for families, couples, and individuals alike!